The aim is to emphasize the success of the award winners, to contribute to the development and progress of the companies operating in the MICE sector, to certify, honor and reward the achievements by motivating them. ACE of M.I.C.E. Awards jury-finalist meeting and glorious award ceremony has been creating an important network for the last 5 years. The giant jury-changing every year-consisting of event planners of corporate companies, sets the first two stages. First stage; applicants will be scored online by the jury committee and the first three finalists of each category are determined. In the second phase; a full-day jury finalist meeting takes place. This year it will be organized the sixth ACE of M.I.C.E. 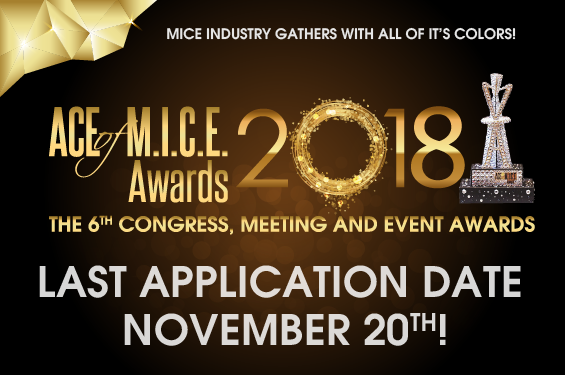 The Awards on April, 2018 and will continue to bring the MICE secession together with all of its colors. The ACE of M.I.C.E. Awards, which was held on February 10, 2012 at Halic Congress Center with the participation of 230 project applications, 160 sponsor companies and 2,500 people from the sector in 28 different categories. Awards have shown that it is an innovative MICE sector that is growing day by day in Turkey. The Awards will determine MICE's ace for the sixth time within the Tourism Media Group organization April 2018. In the ACE of M.I.C.E. Awards Congress, Meeting and Event Awards; Events, Event / Meeting Management Companies, Service Providers and Project Implementations, Meeting Hotels, Best Sociasl Responsibilty ProjectaApplicants will be able to apply through the web site of miceodulleri.com between 2 October and 20 November 2017. Only ACE of M.I.C.E. Awards Applicants who meet the criteria specified in the Congress, Meeting and Event Awards will be accepted. In the first instance, the applicants will be voted online by the 90-person jury consisting of institutional firms and industry professionals through the B2B system of the miceodulleri.com website. After the first election, 3 candidates determined in each category will make their presentations to the jury in the presence of the notary. The winners will be announced on April, 2018 at the magnificent ceremony accompanied by a red carpet ceremony, cocktail-prolonge and fascinating stage shows. After the highest ranking in each category, the 3 finalist company will make a live presentation 1 full day on jury and finalist meeting, in the presence of the notary in each room. A total of 78 representatives of the finalist company who are held simultaneously in three separate presentation rooms at the hotel will benefit to have network on that day. 370 people from the MICE sector, including the heads of govenrment, press, and association, w, in a 5-star prestigious hotel will meet at the jury and finalist meeting day. Following the 7 minute presentation of the finalists, each jury member makes a live call with the help of keypads in front of the member, which is reflected on the screen of the notary separately located on both rooms so that the first of each category is determined according to the highest voting requirement. The first company names are kept by a notary public with great confidentiality, and the companies learn their first place at the awards ceremony held in Oscar like everyone else. Jury and Finalist Meetings are shared live on 11 different social media accounts of Tourism Media Group, the organizer of the Awards. The Brain Storm Meeting of ACE of M.I.C.E. Awards 2018 took place on May 26, at the Life Park with the participation of candidate jury members and event candidates for the 2018 and the feedback received from the sector were evaluated and new categories were added to the awards: Best Adaptation Event, Best Concert, Best Roadshow, Best City Hotel Hotel with Best Meeting Service, Best Beach Hotel Hotel with Best Meeting Service, Best Conference Hotel, Best Good Event Technology Application. The "Best Event Technology" category, which was launced for the first time this year, is expected to attract a great deal of attention. The importance that the ACE of M.I.C.E. demonstrates to technological developments will be organized in Istanbul Congress Center-ICC between February 21-23, 2018, as well as the creation of members of this jury in the field. 5. ACE of M.I.C.E. with it’s TECH ZONE area to be formed during Exhibition by Turkish Airlines. Event technology speakers, who are number one in global MICE industry such as alanda, Corbin Ball, James Morgan, John Martinez and Kerem Baran, will be presenting the satisfactory information about 2018 event technology trends under Speaker's Corner - TECH DAY on 22 February 2018. The category, which was also launced for the first time this year, will be able to applied to both institutions and agencies. Provided that they are still active regardless of time, the application fee for projects competing in the field of social responsibility will be 50% discounted from other categories. In addition to categories, the application and jury evaluation criteria have been renewed from the beginning. The project has included criteria for separating the jurisdictions such as the brief, budget range, carbon footprint measurement, adaptation information, waste management and critical success factor given by the client. In the sixth year, the selection of the jury was also standardized at the awards that were completely renewed in order to keep pace with the developments. In this context, the award will be made only by the board of directors and members of the TETKİD (Turkey Event, Meeting and Congress Sector Managers Association) members. In the board of directors of the Association, where senior executives who plan and direct the event organizations of corporate companies and event agencies, PCOs, DMCs and Incentive companies that serve at high standards in the MICE sector can be members or senior managers, Mercedes-Benz HR Manager, Philip Morris National Events Manager, Pfizer Corporate and Marketing Activities Europe Region Leader, Yıldız Holding Corporate Communications Manager, Hacettepe University Medical Faculty Chief Physician, President of Cardiology, Board Member of Turkish Society of Cardiology and European Society of Cardiology, Nike Event Marketing Director, Denizbank Event and Sponsorship Department Manager, The Coca Cola Company Sponsorship and Event Manager, Anadolu Efes SK. Marketing and Corporate Relations Manager and Garanti Bank Sponsorship and Event Manager. Among the promotion channels of the awards that carried out the communication campaign worth TL 2,385,242.00 in 2017; digital media (advertisement, news studies, interview, banner), digital media (advertisement, news studies, interview, special supplement, insert), visual media (news, interview, subtitle ads, program host, tv-radio news) outdoor (billboard, racket, flag, led screens, bridges, airports, metroars, IDO interiors), publicity (e-mailling, push notifiation, apps, sms, google-remarketing, facebook-instagram-youtube-twitter sharing and advertisements) , THY in-flight advertisements, Maslak panels) and institutional promotions (all promotions by prospective candidates, sponsors and members of the jury using their own channels). In the organization that 64 sponsor companies support every year, you can sponsor in categories such as Main Sponsorship, Category Name Sponsorship and Brand Sponsorship, and you can provide your company's shine among the industry acres. While the MICE industry covers 30% of the tourism income and the 6 billion dollar sector contributes heavily, 148 successful awards have been awarded for 5 years, 10,549 MICE professionals participated in the evening, 376 jury delegates successfully worked, 930 firms applied, 320 sponsor companies provided support. In 2018, the award ceremony will be held with the support of 64 sponsors together with the support of 64 sponsors. The jury of 90 people will evaluate 6 applications and 250 applicants from 26 categories. The guest profile includes the chairman and members of the board of directors of TETKİD (Turkey Event, Meeting and Congress Sector Managers Association), celebrity, state elders, famous names of business and arts organizations, senior executives of corporate companies, MICE professionals, event managers, ministries, federations and expert associations (video, technology, stage-decor, audio-visual-light-production) and the press awards will be held on April 2018. Miceoduleri.com The schedule of details in the Participation Rules section will be as follows: 2 October application start date, 20 November application deadline, 27 November jury online voting start, 15 December jury online voting deadline, 25 December finalists announcement and appointment, 12 January 2017 jury and finalist meeting. You Determine The Best Stand! 5. ACE of M.I.C.E. Exhibition by Turkish Airlines will be held at Istanbul Convention Center between 21-23 February 2018. The best stand award at the exhibition will be voted by the ACE of M.I.C.E. Awards Jury Members and anyone who downloads the ACE of M.I.C.E. mobile application.